SALT's Performance Report Makes Report Writing Easier! SALT software makes language sample analysis as easy as possible for speech and language pathology practitioners, researchers, and students. 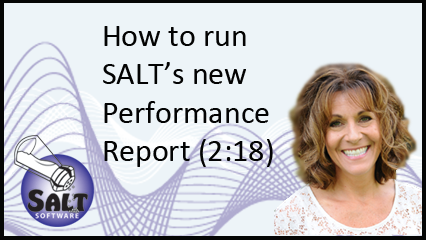 The Performance Report, new with SALT 18, provides a narrative report based on the results of the analyses. Edit this report to suit your needs. Then copy and paste the contents into your diagnostic report. Acknowledgements: SALT Software would like to thank Courtney Seidel, M.S., CCC-SLP (Associate Clinical Professor, Department of Communication Sciences & Disorders, University of Wisconsin-Madison) and Joyelle DiVall Rayan, M.S., CCC-SLP (SLP, Vancouver Public Schools in Vancouver WA & Director of Education and Training, SALT Software LLC), for sharing templates they designed for creating narrative reports. These templates were the inspiration for the Performance Report. And There’s More! Click here for a summary of the other features new with SALT 18. I am a regular SALT user and am really pleased with the new Performance Report. It helps interpret the child's score profile and makes the assessment results much more user-friendly and easy to understand. Can I have the SALT 18 now? LOVE LOVE that Performance Report. SALT has helped me with evaluations, progress monitoring, and just knowing what to work on with my students. The SALT staff and the SALT website have been so helpful when I have questions. The ever-expanding data base of different groups of students and prompts help reflect my expanding caseload. I Love SALT. The SALT program has made my life as a bilingual speech pathologist much easier and my practice as a clinician much more efficient and thorough. I have been using their software program & their services (electronically sending in voice files/transcripts to be transcribed) for the past 5+ years. I can honestly say that without both of these, I would not be as good of a clinician as I am today (and I'm awesome, believe me!). SALT software has endless options and it provides authentic, genuine data that is so very important. Their transcription service is phenomenal. Thoroughly done and quickly returned (seriously, 2-3 day turn around). That which used to take hours upon hours of analysis time is gone. Your balanced work-personal life continues and you have all the info you need to make those oh-so-important decisions. Thank you SALT!! I don't know what I would do without the services that the SALT lab provides to me. I love that I can simply upload a sample to my computer, send it to the lab, and literally have it back within a few days. The lab technicians are responsive to my questions, special requests, and emails and it is a service that saves SLP's precious time and helps us keep our sanity. I give it an A+++!! SALT gives me standardized data from a language sample which is always (always!) a more exact representation of a student's speech and language skills than a standardized test. I get thorough, detailed, and standardized information on various aspects of speech and language (including fluency, word fining, processing time) from the same 5-7 min sample. I can evaluate a Spanish speaking ELL even though I do not know Spanish. And eliciting a language sample reduces stress for the student during the evaluation process - a short naturalistic environment instead of long, stressful, test-taking process. Salt transcription is an enormous help, especially for those of us in school-based practice who need a second measure for qualifying a student under a language disorder. Salt is also extremely helpful for those of us with large caseloads. The software provides wonderful comparisons to same aged peers and can provide detailed clinical information unavailable in most traditional standardized tests. Specifically you can gather data on topic maintenance and an overall intelligibility rating from an unfamiliar listener. The comparison databases for bilingual speakers are also extremely helpful. My testing toolkit would not be complete without using SALT services. And turn-around for transcription services are very fast. Salt is wonderful!